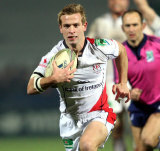 Marshall made his breakthrough for Ulster in the 2011/12 season after he had come through the academy ranks at the club. His good form last season was reflected when he was called up for the Ireland squad to face the Barbarians in May 2012, having already represented Ireland at under-21 and A levels. He has been a regular presence in the Ulster squad since 2006, although 1st XV opportunities have been scarce due to the continued excellence of Ruan Pienaar. Even so he continued to impressed whenever he was given the chance at the start of the 2012/13 season and earned himself a call-up to Irelan'd squad for the autumn internationals.